Fans that missed Twilight Time’s initial Blu-ray release of Ray Harryhausen’s Jules Verne spectacle get a second chance with this Encore Edition reissue. It includes an improved transfer and new extras, including an excellent audio commentary with Steven C. Smith, C. Courtney Joyner and Randall William Cook. The show still sends us, and Bernard Herrmann’s powerful music score shakes the rafters. Starring Michael Craig, Michael Callan, Beth Rogan, Gary Merrill, Herbert Lom, Joan Greenwood, Percy Herbert. Not every Twilight Time limited editon sells out, but some that do sell out fast. The company has re-negotiated ‘encore editions’ of some of their more coveted titles. In the case of their disc of Journey to the Center of the Earth, the newer release had a much improved transfer. The same news has prompted this new reissue of an equally popular Jules Verne fantasy, a coveted Ray Harryhausen title. The first edition was the premiere TT Blu-ray release, back in 2011. As described below, a new extra is included as well. Harryhausen and Schneer’s third color show was a childhood favorite, especially when paired with the three year-old The 7th Voyage of Sinbad in a dynamite matinee double bill. Mysterious Island continued Hollywood’s successful run of Jules Verne adaptations by tackling Verne’s sequel to the author’s most successful story, 20,000 Leagues under the Sea. Embellishing the original narrative with several stop-motion monsters, Harryhausen and producer Charles Schneer had one of their biggest hits. The tale begins very much like Jules Verne’s original adventure story. Union Captain Cyrus Harding (Michael Craig) leads a small band of fellow POWs including war correspondent Gideon Spillett (Gary Merrill) in an escape from a Confederate prison, using a rebel observation balloon. 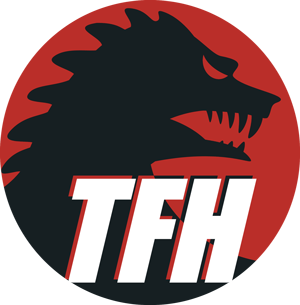 An unprecedented storm blows them Westward across the American continent and most of the Pacific Ocean before depositing them on an uncharted island. There they struggle to survive against bizarre gigantic wildlife and marauding pirates. They join up with a pair of English shipwreck survivors (Joan Greenwood and Beth Rogan) along the way. They don’t know that they are being watched over by the island’s secret inhabitant, the notorious Captain Nemo (Herbert Lom), who was presumed to have gone down with his terror-submarine Nautilus a few years before. 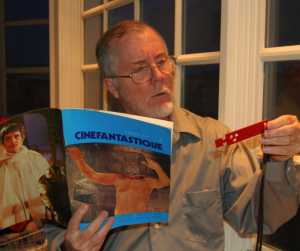 Randall William Cook unpacks the original tentacled nautilus monster for the Academy of Motion Picture Arts and Sciences, May 2010. Mysterious Island remains a favorite of many Harryhausen fans; they respond to its adventure and veritable smorgasbord of unique monsters. Either ace director Cy Endfield was better with actors, or the production allowed more time for them, but the live-action scenes are smooth enough not to seem like filler in between the effects scenes. In a way this quaint quasi-Robinson Crusoe & monsters movie seems a dry run for Endfield’s later, brutal Sands of the Kalahari. Not to take away from the capable Kerwin Mathews, but having the likes of Herbert Lom, Joan Greenwood and Percy Herbert doesn’t hurt either. The English actors are classy and credible, even if Herbert’s Southern accent frequently slides into Cockney. The levelheaded Michael Craig is convincing as an American while Michael Callan and newcomer Beth Rogan make an okay ingenue couple. Dan Jackson is a robust Neb Nugent. He is given equal character time until the full cast assembles, at which point his dialogue lines drop almost to nothing. In a standout performance, Herbert Lom’s formidable Captain Nemo dishes out iffy expository lines about his survival and unlikely experiments in a way that makes them sound like great writing. And there’s no replacing the deep voice of Joan Greenwood, who enlivens her stock role with her own veddy proper elitist charm. It’s rather fun watching drawing-room actors like Greenwood (The Importance of Being Earnest) and Gary Merrill fighting a giant prehistoric bird — they seem to be enjoying themselves mightily. Mysterious Island‘s menagerie of threatening monsters was simply delightful on a first viewing, but, as much as the film is a pleasant diversion, it’s also one of Harryhausen’s most formulaic pictures. Both the script and Harryhausen’s scenes are episodic to a fault, and too many of the thrills are overly familiar. After a tense and exciting balloon escape for the opening, the show plays out almost entirely on Schneer’s overused Spanish beach setting. The pace is slow, not helped by frequent torpid ‘exploration’ scenes, covered by Michael Craig’s narration, where little happens. There’s little forward motion and no real character conflict. When the castaways meet Nemo near the conclusion, they’re the exact same people who landed on the island months before. When the aristocratic Nemo does show up, his commitment to his newfound friends is not explained. He’s such a misanthrope that we wonder why he cares enough to save their skins. After some fairly static reels, Nemo’s decision to sit in his submarine and accept a morbid fate is a real downer. Even to 9 year-olds, the fact that the sub never sets sail is another big letdown. Our heroes escape by virtue of a last-minute engineering miracle, but the reformed Terrorist doesn’t make it. Admittedly, the Verne source novel is the culprit for all the eye-rolling unlikelihoods and coincidences, but Mysterious Island doesn’t exploit the interesting situations that the dodgy plotting creates. The theme of War runs through the whole show without once finding expression; even the tin-pot A.I.P. Master of the World handles Robur’s pacifist fanaticism in a more consistent way. Yellow tabloid journalist Gideon Spillet (I guess that’s what he does with the news) and Nemo exchange a few remarks, and that’s it. Disney’s superlative show succeeded because he presented Verne’s aquatic Terrorist unapologetically, as Verne described him — a genius-maniac righteously opposing colonial oppression. No matter how well Herbert Lom plays him, this sequel’s Nemo is a reborn environmentalist nice-guy, a smudge on Nemo’s unrepentant honor. Harryhausen’s animation effect scenes are terrific, but none of them advance the story. The monsters appear, our heroes stick poles at them (and eat a couple, as well) and they exit. The most entertaining critter is the red-crested antediluvian Phorohacos, which delights kids. We didn’t care back in ’61, but my kids rather resented Harryhausen/Schneer’s tendency to kill off so many of their monsters. My daughter loved the puppy-like reptile of The Beast from 20,000 Fathoms but didn’t want to see the movie twice because of the death scene. Likewise for the defenseless newly hatched Roc chicks in The 7th Voyage of Sinbad. The kids quickly figured out the movies’ episodic ‘poke-sticks & die’ nature, and cheered when the One Million Years B.C. turtle Archelon escaped unharmed. Part of the delight of the giant bird is Bernard Herrmann’s wonderful scoring, which manages to be whimsical and heavy at the same time, sort of a Wagnerian Turkey in the Straw. Herrmann’s thunderous music is the glue that holds the film together and provides much of its grandeur. It might not be popular to say outright, but the non-animation special effects in Mysterious Island are not Harryhausen’s best. Some of the matte paintings are unlikely vistas not very well realized, with perspective problems to boot. And complicated scenes calling out for large set construction are solved through mattes and composites that even in original prints looked dupe-y and circumspect. In 7th Voyage, Harryhausen designed a beautiful tunnel entrance for his Cyclops; a fairly undetectable meld of miniature set (the carved arch) and live-action footage. Here, there’s a fortress in a cliff side cave overlooking the beach, made of five or six cleverly arranged but painfully artificial optical elements. It’s a key location, and it’s never very convincing. Many scenes, such as the grotto lagoon where the Nautilus has come to rest, are large, static miniatures with little people matted into them. Couple that with endless slow-motion underwater scenes, and a stock genre volcanic eruption that also has no real character involvement, and the back end of Mysterious Island is slow going. But it comes to life with Bernard Herrmann’s warbling bassoons and mighty crescendos. Columbia filmed Mysterious Island as a serial ten years previously, somehow adding a female alien from Mercury into the mix. The part-talkie 1928 MGM pastiche remains one of the weirdest and most costly Hollywood fantasy films, and there was a Soviet effort (made during WW2) that was reviewed positively in old European journals. Reviewers of this Harryhausen version often commented on the no-show of familiar actor Nigel Green (Hercules in Jason & the Argonauts), whose name appeared in all the official cast lists. Green’s scenes were cut – he appears to be the skeleton that the castaways find in their cave fortress. Perhaps a diary-inspired flashback pirate story got dropped, one similar to the lighthouse-wrecker saga of The Light at the Edge of the World – ? Twilight Time’s new Encore Edition Blu-ray of Mysterious Island is an improvement on the 2011 disc, but I had to make a close examination to see the differences. Actually, my more technical friends pointed out the differences, finer points of color & scenes where the grain was improved. The volcano sequence has a lot of mattes on mattes on mattes — it looks slightly improved. The most impressive thing I saw anew this time was pointed out by Craig Reardon: in the Phororacos scene, Harryhausen inserted a little vertical piece of art board into his table top, and painted on it to make a perfect match with the fence and foliage behind. It covers the post that Gary Merrill wallops with his tree branch. It’s just amazing, the tricks Harryhausen used. The new release isn’t just for fans that lost out on the first disc, and didn’t want to pay the scalped prices on the web. Twilight Time has produced a new commentary that’s well worth listening to. Writer C. Courtney Joyner has plenty of info on the film and especially the differences between it and Jules Verne’s original novel. More than a few vestigial traces of original themes remain in the finished film. We also get a full explanation of the Nigel Green ‘green man’ story, dropped from the show in mid-production. Music biographer Steven C. Smith goes deep into the Bernard Herrmann soundtrack issues. Bouncing off both subjects is Oscar winning effects expert Randall William Cook. He keeps the other two honest — the trio harmonizes well when addressing a particular subject — and adds a level of comment on the animation effects and story construction that made me appreciate Mysterious Island more than I had before. The three of them even point out felicities in Cy Endfield’s direction, that seemed stronger after their commentary. We feel like we’re learning something, when Cook points out rock formations in the background of shots, that were used for The 7th Voyage of Sinbad. Also included are two featurettes, a short chat with Harryhausen on the film repurposed from the old DVD, and something I haven’t seen before, a vintage B&W promotional short called Islands of Mystery. I guess the more Sony goes through their vaults, the more they will find. 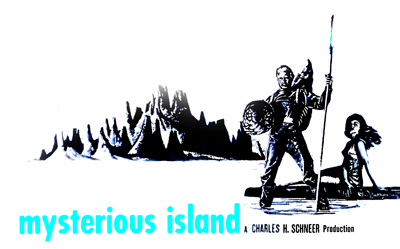 Supplements: Isolated music score, original trailer and TV spot; Commentary with Randall William Cook, C. Courtney Joyner & Steven C. Smith; Harryhausen on Mysterious Island featurette; Islands of Mystery featurette.